Tomorrow People Writing's On The Wall Tour. Out of the 100+ reggae bands currently active in NZ, not one of them has moved up the ranks faster than Wellington band Tomorrow People. From their humble garage to an award-winning debut album, the band has gone from strength to strength and showing no signs of slowing down. A studio project turned live stage show, the 7-piece band are purveyors of what they describe as ‘sunshine reggae’. Focused on providing a mid-tempo sound that, while clearly reggae-centric, adds touches of dancehall ragga to its colour. It is a sound built around strong vocals, soothing harmonies, catchy hooks, aggressive ragga raps, and feel good riddims (rhythms). Together, the members of mixed descent (NZ/Maori/Pacific Island) have decades of experience in the music industry, citing previous careers in hip-hop, R&B, gospel, funk and soul. 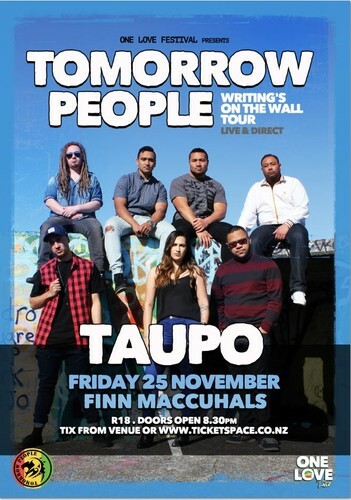 Taking their name from a Ziggy Marley song, Tomorrow People live up to the futuristic allusions it casts, having built their fan base via social media (www.facebook.com/tomorrow.ppl) and demo tracks uploaded to YouTube. While they gather their musical influences from Jamaican and Hawaiian artists alike, once combined with their roots in NZ music, they bring a sound that is clean, laid-back and easy on the eardrums. They have built their movement predominantly through their live shows and the online world. The result of their hard work is evidenced by having over 5 million views of their songs and countless YouTube remakes and remixes from around the globe. In June 2012, the band released their 13-track album ‘One’ which inevitably shot straight to #1 on the official NZ music charts. It remained in the album chart for over a year and was placed #8 in the Top 40 albums of 2012 across all genres. This album spawned a host of high-rotation radio hits which led to invitations to play at the country's biggest festivals Homegrown, Rhythm n Vines, Raggamuffin and One Love to name a few. Tomorrow People’s Gold-certified album showcases all original tracks written, recorded, produced, mixed and even funded by the band itself in true Kiwi D.I.Y fashion. November 2013 saw them release an experimental EP ‘One.5’ where they wanted to explore different avenues of roots music. This was received extremely well by old and new fans alike.